There were improved prices for 213 beef cattle at Ballymena. Prime heifers to 225 pence per kg for a 530kg Limousin. Prime steers to 208 for a 600kg Lim. Beef cows to 212 pence for a BB 850kg, Friesians to 134 pence for 790kg. Beef Cows: J M Morrison, Coleraine BB 850kg £1802 (212), local farmer Char 740kg £1358 (194), A McNeilly, Antrim Lim 740kg £1413 (191), K Woodside, Islandmagee CHA 760kg £1398 (184), A Baxter, Ballyclare Lim 520kg £930 (179), BB 470kg £770 (164), J & R McKeown, Aughafatten BB 760kg £1292 (170), Lim 670kg £1105 (165), K Woodside, Islandmagee Lim 700kg £1190 (170), D McGarel, Glenarm Cha 570kg £951 (167), W.T. McGookin, Larne Cha 820kg £1344 (163), M Johnston, Toome Lim 780kg £1263 (162), A Clements, Muckamore Lim 680kg £1088 (160), AA 650kg £1007 (155), H Marquess, Muckamore Cha 670kg £1072 (160), W Fleck, Broughshane ST 740kg £1176 (159) Cha 820kg £1271 (155), D Millan, Ballymoney Blo 700kg £1092 (156), A Henning, Moira AA 1010kg £1565 (155). Friesian Cows: T Adams, Rathkenny 790kg £1058.60 (134), 640kg £793.60 (124), A Carson, Clough 640kg £787.20 (123), WR&JR Dunn, Ballyclare 670kg £804 (120), JAS & M Wilson, Broughshane 770kg £908.60 (118), local farmer 660kg £772.20 (117), Ballybracken Farms, Ballynure 670kg £777.20 (116), R&T Smyth, Randalstown 630kg £724.50 (115), local farmer 620kg £713 (115), 590kg £637.20 (108),560kg £632.80 (113), M Wilkin, Islandmagee 660kg £752.40 (114), 710kg £781 (110), A Gibson, Glenarm 620kg £694.40 (112), local farmer 690kg £759 (110), 680kg £741.20 (109), R&T Smyth, Randalstown 580kg £632.20 (109), H Stewart, Ballyclare 610kg £658.80 (108). Prime Heifers: V Cousley, Magherafelt Lim 530kg £1192.50 (225), 600kg £1284.00 (214), W Craig, Larne Lim 500kg £1055 (211), L Park, Ballynure Lim 540kg £1090.80 (202), R McNabney, Broughshane Lim 540kg £1080 (200), W Weir, Carrickfergus Lim 580kg £1136.80 (196), Cha 620kg £1196.60 (193), R Milne, Bellaghy Lim 510kg 3994.50 (195), Sim 460kg £892.40 (194), L Park, Ballynure Lim 540kg £1036.80 (192), E Ferguson, Magherafelt Lim 680kg £1285.21 (189), WC McMaster, Gleno Lim 540kg £1009.80 (187), T Wray, Carnlough Lim 530kg £991.10 (187). Prime Steers: H Healey, Belfast Lim 600kg £1248 (208), JM Morrison, Coleraine BB 870kg £1774.80 (204), R McIlveen, Kells Lim 680kg £1380.40 (203), R Milne, Bellaghy Lim 540kg £1080 (200), E Ferguson, Magherafelt Lim 640kg £1280 (200), P Higgins, Martinstown Lim 650kg £1293.50 (199), K McClenaghan, Antrim SH 690kg £1359.30 (197), Lim 750kg £1477.50 (197), H Boyd, Newtownabbey Cha 710kg £1384.50 (195), R McIlveen, Kells Cha 740kg £1435.60 (194), H Boyd, Newtownabbey Sim 820kg £1582.60 (193), E Ferguson, Magherafelt Lim 700kg £1351 (193), AA 720kg £1382.40 (192), P Higgins, Martinstown Lim 700kg £1344 (192), R McIlveen, Kells Lim 630kg £1209.60 (192), T McErlaine, Rasharkin Her 710kg £1356.10 (191), K McClenaghan, Antrim Lim 670kg £1279.70 (191), H Millar, Kells SH 650kg £1235 (190). There was much improved trade for dairy stock on Friday with a choice calved heifer from Robert McCluggage, Larne at £1890. Ruling prices: Robert McCluggage, Larne calved hfr £1890, S Dunlop, Dundrod calved hfr £1800, T & J Mackey, Ballynure calved cow £1500, JC Barkley, Ballymena calved cow £1380, G & AM Patton, Carrowdore calved cow £1100. A good entry of 59 lots in the suckler ring sold well to £2100 for a 3 ½ year old Lim bull from a local farmer, while HR Galway, Holywood sold cows with calves to £1580 for a Stabiliser with heifer calf at foot. HR Galway, Holywood, St £1580, Patrick Logan, Ahoghill Lim £1580, HR Galway St £1570, (2) St £1550, £1480, St £1460, St £1440, St £1420, St £1380, (2) St £1340, St £1320, St £1300, Trevor Andrews, Raloo Here £1300, Ian Gibson, Broughshane St £1300, K Bryson, Eglinton (2) Lim £1300, WJ & D Wallace, Ballymena Lim £1270, HR Galway (2) St £1250, (2) St £1200. 152 weanlings sold to 254 pence per kg for a 260kg Lim heifer at £660. Stronger heifers to 247 pence per kg for a 320kg Lim at £790, strong bullock calves to 222 pence for a 380kg AA at £845. Heifer calves 0-300kgs: H McAlister, Aghadowey Lim 260kg £660 (253), Lim 290kg £710 (244), J McCamley, Carrick (2) Char 240kg £515 (214), J & R McKeown, Aughafatten Sim 290kg £615 (212), JH Fitchie, Comber Sim 240kg £505 (210). 301-350kgs: Hugh McAlister, Aghadowey Lim 320kg £790 (246), S Magorrian, Downpatrick Sim 350kg £735 (210), Mrs D Kennedy, Larne Lim 320kg £660 (206), Hugh McAlister Lim 350kg £700 (200), James A Ross, Islandmagee SHB 320kg £630 (196), Lim 330kg £630 (190). 351kg and over: Mrs D Kennedy, Larne Lim 370kg £780 (210), H McAlister, Aghadowey Lim 360kg £740 (205), Mrs D Kennedy Lim 380kg £765 (201), Lim 390kg £780 (200). Bullock calves 0-300kgs: J McCamley, Carrick (2) Char 290kg £650 (224), R Irwin, Dervck (3) BB 270kg £570 (211). 301-350kgs: Mrs D Kennedy, Larne Lim 350kg £775 (221), Lim 350kg £770 (220), N & J McKee, Larne Lim 340kg £685 (201), K Kidd, Broughshane Char 340kg £685 (201), Lim 320kg £620 (193). 351kg and over: A Scott, Templepatrick (3) AA 380kg £845 (222), S Magorrian, Downpatrick Char 410kg £910 (222), Mrs Diana Kennedy, Larne Lim 380kg £835 (219), S Magorrian, Downpatrick Sim 380kg £820 (215), Mrs D Kennedy, Larne Lim 400kg £860 (215), Lim 360kg £765 (212), K Kidd, Broughshane Lim 370kg £765 (206), Mrs D Kennedy Lim 380kg £775 (204), Lim 440kg £895 (203). 167 lots in the calf ring sold to £520 for a 3 month old Char bull. Partly reared heifer calves to £370 for an AA. Young bull calves to £425 for a month old Simmental. Beef bred bull calves sold to: E Houston, Glarryford Char £520, Leslie Wilson, Doagh AA £495, Sim £455, JA Wilson, Doagh AA £430, Brian J McAlister, Mosside Sim £425, S Scullion, Glenarm AA £410, PH Henry, Cookstown AA £400, JA Wilson AA £400, H & L Wilson, Larne Fr £400, JA Wilson (2) £395, A Beggs, Kilwaughter £390, J & E Millar, Antrim Lim £375, D Parke, Magherafelt AA £375, JA Wilson AA £365, AA £360, AA £355. Heifer calves sold to: D Parke, Magherafelt AA £370, Leslie Wilson, Doagh Sim £360, Sim £350, WJ McKendry, Cullybackey Lim £345, Leslie Wilson Sim £335, WJ McKendry, Cullybackey Lim £335, SJC Woodburn, Ballyclare BB £325, Brian J McAlister, Mosside Lim £325, TJ Johnston, Glenavy Sim £315, Dominic Mawhinney, Bellaghy Here £300, Here £295, SJC Woodburn BB £295, BB £280, WJ McKendry, Lim £270, WA Woodside, Islandmagee Lim £270. Friesian bull calves sold to: H & L Wilson, Larne £400, CR & CM McIntyre, Bushmills £230, SJC Woodburn £215, FG & T McMullan, Broughshane £195, CR & CM McIntyre, Bushmills £165, (2) £155, FG & T McMullan, £145, DS & D McKay, Rathkenny £110. An entry of just over 1000 sheep was catalogued on Monday evening in the first of the seasonal sales. A pedigree sale of Dorsets sold to 4000gns for a super ewe lamb presented by Raymond and Julie Hill, Doagh. Ram lambs to 650gns, females to 320gns. Breeding hoggets sold to £154, stores to £73.50, ewe lambs to £79. Hoggets sold to: M Hartley, Moneymore 12 Suff £154, M Fulton, Ballymena 11 CB £148, M Fulton 10 CB £148, Mrs R Dunlop, Portglenone 6 CB £138. Store lambs sold to: Rbt Loughery 32 Mule £73.50, J Alcorn, Glengormley 15 Tex £73, Sheriff Topping, Kilwaughter 8 Tex £72.50, T Millar, Broughshane 31 Tex £70, RB & JH Kennedy, Dundrod 40 Tex £70, T Millar, Broughshane 25 Suff £67.50, Jonathan Loughery, Limavady 11 Mule £67, Robert Loughery 49 Mule £65.50, Patrick McNeill, Ballycastle 11 Suff £65.50, Robert Loughery 49 Mule £65, Ian Gibson, Broughshane 25 Suff £63.50, I Lindsay, Crumlin 8 Char £60, Sheriff Topping 14 Char £60, McAuley farms, Cushendun 34 Tex £58.50, Paul Butler, Rathkenny 14 Tex £58.50, McAuley farms 12 CB £56.50. Ewe lambs sold to: James McAuley, Cushendall 10 Suff £79, W McIlwaine, Ballyclare 14 Tex £68, Ian Gibson, Broughshane 25 Suff £67, James McAuley 10 Suff £67, Sheriff Topping, Kilwaughter 8 Tex £66.50, Felix Black, Glenariffe 16 CB £40. 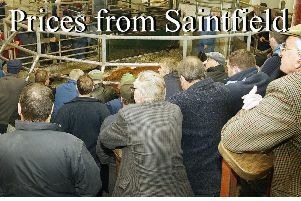 An entry of 140 store cattle in Ballymena on Tuesday sold to a super trade. Bullocks sold to £630 over for a Char 670kg at £1300 presented by Dale Orr, Downpatrick. Heifers sold to £520 over for a Char 580kg at £1100 sold by James McLoughlin, Carnlough. Heifers sold to: A Thompson, Straid AA 430kg £950 (220), Lim 440kg £935 (212), Lim 440kg £910 (206), Andrew McKnight, Antrim Lim 380kg £770 (202), Lim 450kg £905 (201), James McLoughlin, Carnlough Char 460kg £920 (200), Andrew McKnight Lim 400kg £790 (197), Lim 410kg £800 (195), James McLoughlin, Carnlough Char 580kg £1100 (189), Andrew McKnight Lim 420kg £795 (189), R Mawhinney, Mallusk Par 550kg £1040 (189), A Thompson, AA 400kg £755 (188), R Mawhinney Lim 570kg £1075 (188), Andrew McKnight Lim 400kg £750 (187), G McLoughlin, Carnlough Char 510kg £950 (186), James McLoughlin Char 570kg £1060 (186). Bullocks sold to: Local farmer Lim 400kg £930 (232), Char 430kg £940 (218), Hazel Forsythe, Ballynure Lim 350kg £765 (218), C Tinsdale Char 530kg £1140 (215), local farmer Char 470kg £1010 (214), C Tinsdale Char 530kg £1120 (211), Hazel Forsythe Lim 400kg £845 (211), C Tinsdale Char 590kg £1230 (208), local farmer Char 490kg £1020 (208), C Tinsdale Char 580kg £1200 (206), local farmer Lim 470kg £970 (206), WHS McCrory, Glenarm Char 550kg £1135 (206), local farmer Lim 470kg £970 (206), Lim 480kg £985 (205), Lim 490kg £1005 (205), Dale Orr, Downpatrick AA 590kg £1200 (203). An entry of 2567 sheep in Ballymena on Wednesday resulted in a sharper trade. Fat lambs sold to 391p for 5 Texels 24kg at £94 from G Martin, Broughshane and to a top per head of £100 for a heavy Texel from David Warwick, Moorfields. Fat ewes sold to £120. Top prices per kg: Graeme Martin, Broughshane 5 Tex 24kg £94 (391), W Knowles, Cloughmills 5 Tex 23kg £90 (391), N McClure, Ballymoney 2 Tex 23kg £90 (391), J Murray, Ballymoney 10 Tex 22.5kg £88 (391), Hanna Hall, Newtownabbey 3 Tex 23.5kg £91.80 (390), Stuart Hall, Larne 12 Tex 23.5kg £91.80 (390), J Kearney, Ballymoney 36 Tex 24kg £93.50 (389), WJ Cubitt, Rasharkin 3 Tex 24kg £93.50 (389), WJ & D Wallace, Ballymena 11 Tex 21kg £81.80 (389), RW Saunderson, Glenwherry 33 Char 23kg £89.20 (387), JH Craig, Carnlough 15 Tex 23kg £89 (387), Wm Hamilton, Doagh 13 Rom 23kg £89 (387), John Lennox, Kilrea 5 Tex 23kg £89 (387), JAB Alexander, Glarryford 2 Tex 23kg £89 (387), R Taylor, Upper Ballinderry 17 Tex 24kg £92.80, G Calderwood, Rasharkin 23 Tex 22.5kg £87 (386), Norman McBurney, Moorfields 32 Char 24kg £92.80 (386), W & J Gardiner, Ballyclare 11 Tex 22.5kg £87 (386), WJN McClintock, Broughshane 8 Tex 22.5kg £87 (386), David Duffin, Toomebridge 21 Tex 24kg £92.80 (386), Stephen Mashall, Ballymena 49 Suff 22kg £85 (386), G Irwin, Ballyclare 8 Tex 23kg £88.80 (386), John Kennedy, Newtownards 27 Tex 21.5kg £82.80 (385). Top prices per head: David Warwick, Moorfields 1 Tex 34kg £100, R Taylor, Upper Ballinderry 2 Tex 29.5kg £96, John Laverty, Armoy 12 Tex 26kg £95.50, G Scroggie, Armagh 1 Suff 27kg £95, CA McAuley, Cushendall 1 Suff 31kg £95, Ken Woodside, Islandmagee 16 Tex 25.5kg £94.50, Graeme Martin, Broughshane 4 Tex 24kg £94, 1 Tex 24kg £94, J Adams, Ballymena 16 Tex 25kg £94, J Kearney, Ballymoney 36 Tex 24kg £93.50, M Wallace, Ballymena 26 Tex 25kg £93.50, WJ Cubitt, Rasharkin 3 Tex 24kg £93.50, AJ Wilson, Ballymena 14Tex 24.5kg £93.50, L Hunter, Ballyclare 2 Char 26.5kg £93.20, AS Pearson, Newtownards 7 Tex 26kg £93, A Dempsey, Aghadowey 2 Tex 25kg £93, T Hoey, Ballymena 2 Dor 25kg £92.80, R Taylor, Upper Ballinderry 17 Tex 24kg £92.80, Norman McBurney, Moorfields 32 Char 24kg £92.80, David Duffin, Toomebridge 21 Tex 24kg £92.80, Darren Stewart, Ballyclare 8 Tex 25.5kg £92.50, S O’Rawe, Ballycastle 17 Tex 24kg £92.20, J McNeill, Moorfields 3 CB 24kg £92, I Marcus, Ahoghill 5 Dor 24kg £92.